HA: Katie, welcome back to Homeschool Authors. HA: Your series, Supervillain of the Day, is now in its second season. How is it going? Katie: If you asked me this last week, or even yesterday, I would have said "Absolutely terrible." And if you ask me next week, or tomorrow, you'll probably get the same answer. But you asked me to today, and today it's going remarkably well. As I said to a friend earlier, I have a logical plot, believable character interaction, an intimidating lineup of supervillains, and several ancedotal scenes that show every day life under the supervillain occupation. Not sure what it has to do with the title yet (Dragon of London) but I'm in love with it. So we'll figure that out later. HA: What is the most encouraging review of the series you have received so far? Katie: The most encouraging review I got was actually from a beta reader for "Silent Night" who said he had no critique whatsoever. 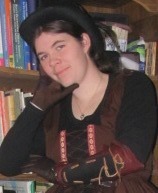 That made me really, really happy because I about killed myself (and my characters) writing that story. Otherwise, pretty much any interview that "gets it" is really encouraging to me. I have a strange humor style, and sometimes I worry that nobody else will understand it. And then they do. This pleases me. HA: When you are not writing or chasing supervillains, what do you enjoy doing? Katie: EVERYTHING. Ha. Actually, I gave up on reading lists a very long time ago because I never stick to them. When I'm finished with a book I reach out blindly into a giant heap and read whatever comes up. In which case I put it back and pick something else. I do, however, plan to finish the Dresden Files and the Harry Potter series, and maybe reread some old favourites. HA: Can you give us a sneak peek into your upcoming book? Katie: Long one or short one? Frank Riley had been fighting fires for upwards of thirty years. He'd seen electrical fires, brush fires, fires started by someone's careless child, and arson cases resulting in heavy damage. He'd testified in a dozen trials, and rescued countless cats, children, and other trapped persons. Every time he went into a burning building he knew he ran the risk of not coming back out again, but he accepted that and was comfortable with it. And then everything changed. Instead of arson cases being few and far between, they became the number one cause of fires. Instead of rescuing the occasional trapped cat or grandmother he found himself coordinating with dozens of other rescue workers to pull hundreds of trapped people out of infernos designed to incinerate them. He arrived at fires intended only as a distraction to allow killers to escape, and he saw the mutilated bodies they left behind. He found his job was suddenly part fire-fighter, part detective and part that of a helpless, angry bystander. London had been a great city, one he was proud to call his home. But a year of fighting had torn it to shreds. The countless fires, explosions and acts of violence had destroyed years of work and legacy and left gaping wounds in the landscape. The worst part was, he knew it was the same all over the world. Seen from orbit he had no doubt that the planet resembled one of Einstein's cats. And then there were days like today. Days when all things like “reason” and “sanity” became meaningless, and you wanted to revert to your primal state and go running screaming into the woods, never to emerge again. “Lost a lot of good ones,” Adams said swiftly. “Didn't we all,” Riley said. “So what have you got?” Adams said. Riley grinned. “Something like that,” he said. Adams sat down and watched the footage. And then he watched it again. “You were there,” Adams said flatly. Adams leaned back and sighed. “We're in trouble,” he said. Floyd slept for twelve hours, and he woke up crying. Hey, I said short! I wrote all of this just this morning and they may or may not make it into the final version. Although they probably will because so far this draft is AWESOME. HA: What should readers expect when they read Superhero of the Day? Katie: Fun. Hilarity. The adventure of a lifetime. Floyd. Joseph Adams. Supervillains. Lots and lots of supervillains. And oh yes, there will also be pain. Some authors know how to write really good art. I just know how to manipulate you into /thinking/ it's art, mostly because you're too stunned to notice what's actually going on. Katie: Setting a series in England has the unintended side effect of making it hard to write in American. I as looking at one of my other novels and having trouble readjusting my brain to align with that of a typical American highschooler. I kept thinking things like: "Oh yeah, Americans drive cars." and "Americans don't use the British spellings of things. Unless they're weird, like me." 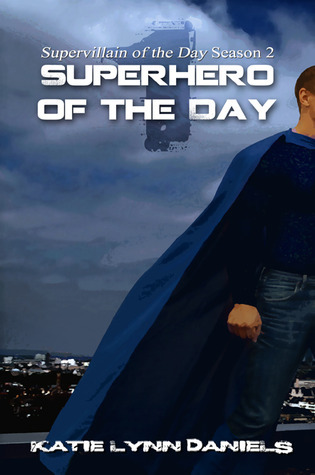 This week, buy Superhero of the Day for only $0.99 cents, review it, and earn an entry. For all the Read to Win details click here. What do I do if I already purchased and reviewed the book previously? I don't think yours for Superhero of the Day has been posted on Amazon yet, Leah. I've only got one up there so far.